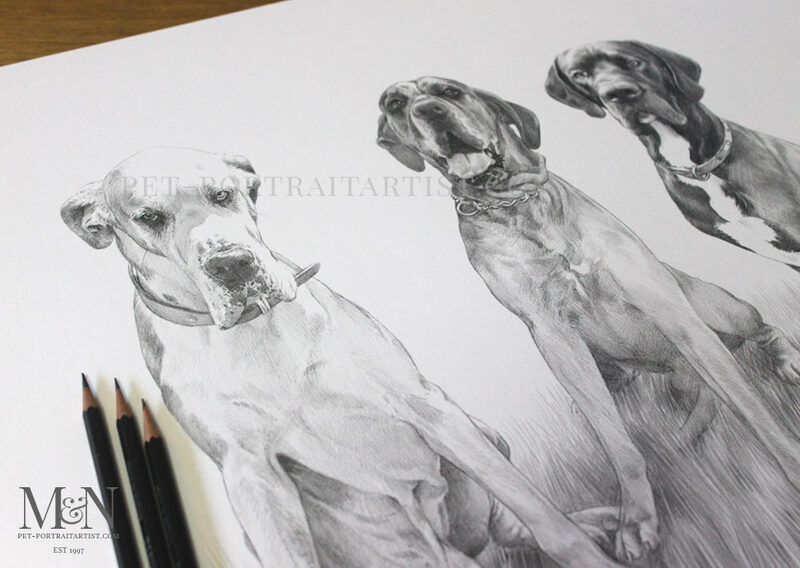 Welcome to my latest Great Dane portrait of Deano, Ole & Neo. 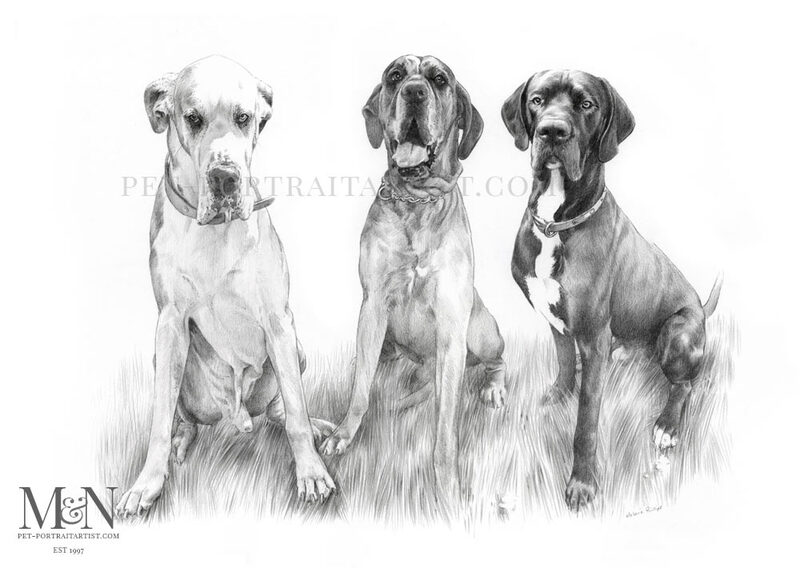 Our clients wanted a portrait of their three beautiful great danes, two of which sadly aren’t with us any longer. 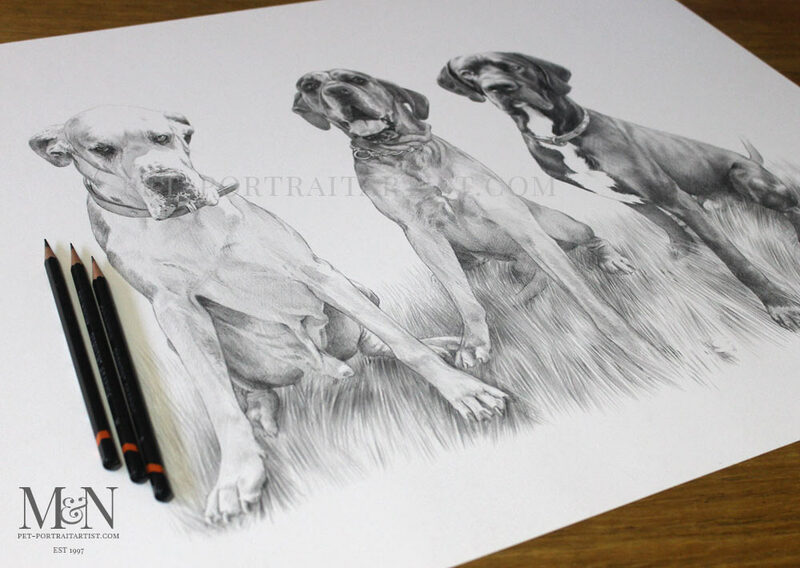 Only the great dane on the right called Neo. Nicola emailed all of the photos she had of Deano and Ole. To find out if they were suitable for a portrait. I created a mockup using the two best photos of them. I then asked Nicola to take some new photos of Neo in her garden, with him at a particular angle. This allowed me to add Neo into the scene. With a few mockups going back and forth, a a couple fo photoshoots later, we had the perfect composition! Nicola decided she also wanted her portrait at 24 x 18 inches. 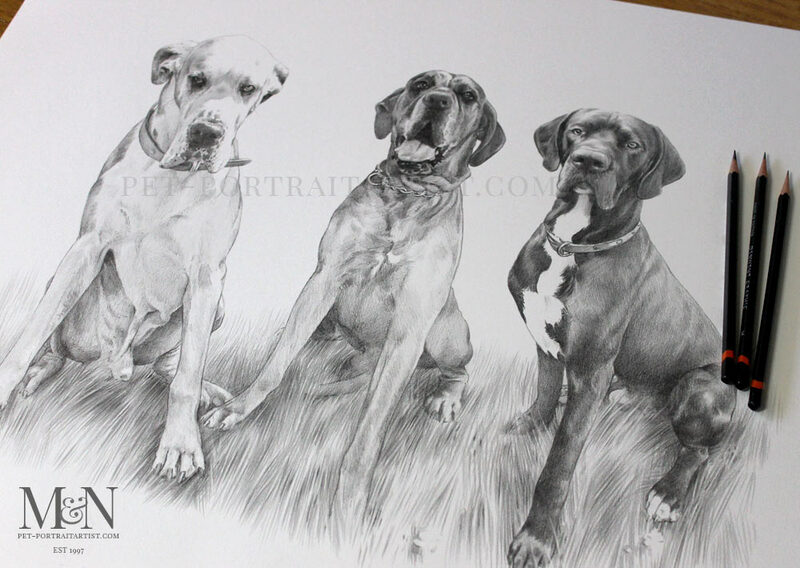 Thats a good size for such stunning animals as Great Danes. Above all you don’t want to have anything too small for a large dog breed size. The portrait came out really well and Nicola was thrilled. You can read Nicola’s email below which she saw the portraits final scan. If you scroll down further you can also see photos of the portrait with my pencils. Plus some happy client photos too! I’m literally speechless! What a fantastic job you have done, the portrait is amazing! You have captured them perfectly! It will be something we can treasure and look at forever! Thank you so much. Of course, I would be delighted to send you a photo once it’s framed and taking pride of place in our lounge! 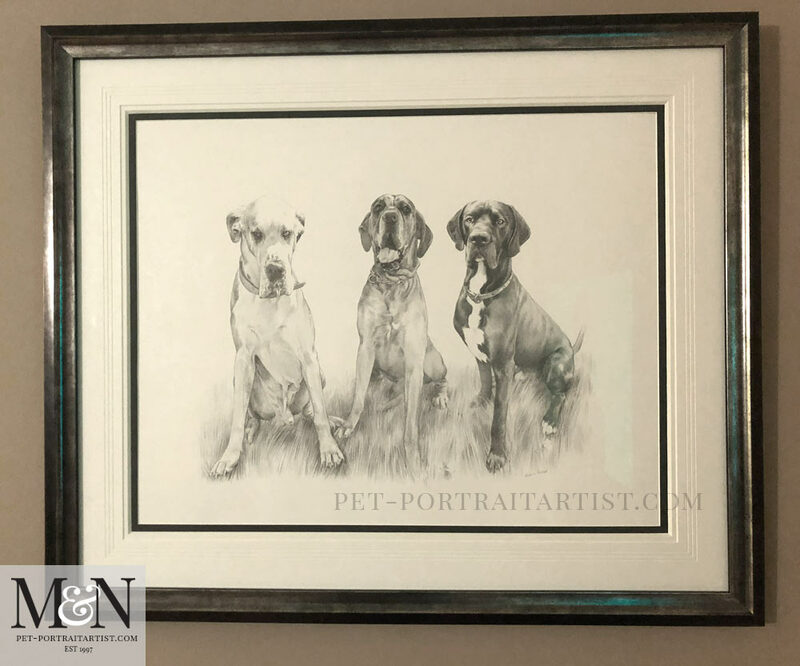 Nicola used her friendly local framer to frame the drawing of Deano, Ole and Neo. We absolutely love it. 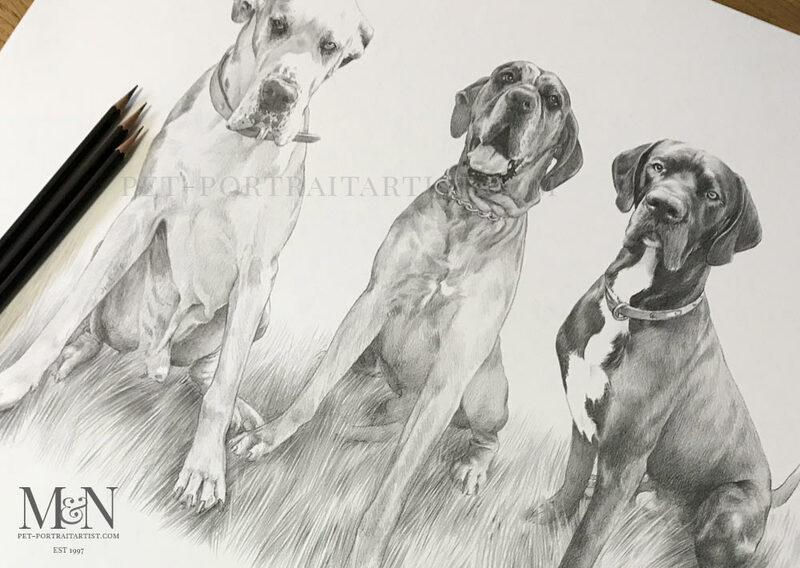 Their silver frame is beautiful and the colours work very well with the black and white drawing – very striking! My drawing is also accompanied by a triple mount with a black inner mount which compliments the drawing beautifully. I can’t thank Nicola enough for taking the time and photographing the drawing for me. 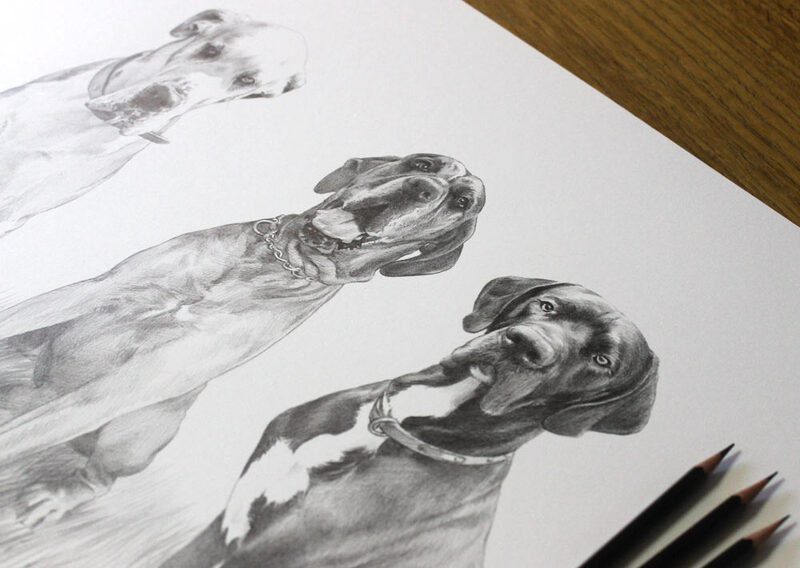 You can see this and more dog portraits on our dog portraits testimonials pages on our website. I taken a few photos of the portrait along with my pencils below. If you would like to commission your own painting or drawing from either myself or Nicholas we would be delighted to hear from you. Consequently, email us a few photos that you feel capture your dog well. In addition let us know about the kind of portrait you have in mind. We are always here to give help or advice and chat about your ideas for a portrait. Visit our websites contact page and drop us a line today!